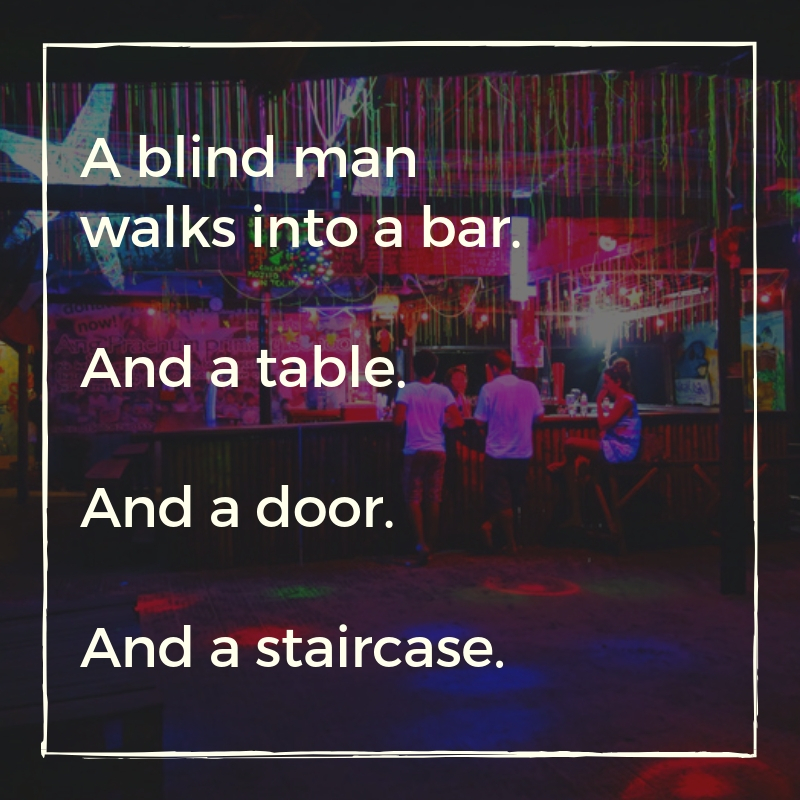 20+ Bar Jokes | Who Walked Into The Bar This Time? Whenever we gather with our friends during whatever occasion, we usually share funny stories to lighten up the mood. One of the jokes we generally tell them is a bar joke. You may believe that every bar joke begins with “X walks into a bar” but you are totally wrong. Some of our bar jokes here in QuoteReel.com do not even begin with that. If you think that you have run out of good bar jokes to tell your friends, it is now time to refresh your bar jokes repertoire and earn your rightful rank as the official comic in your own gang. Q: What did the Bartender say when two jumper cables walk into a bar. A: You guys better not start anything in here. A duck walks into a bar and says to the bartender, “I’d like to buy some peanuts.” The bartender says, “Sorry, don’t sell peanuts.” The duck leaves. The next day, the duck returns and again says, “I want to buy some peanuts.” The bartender replies, a bit gruffly this time, “I already told you I don’t sell peanuts.” The duck leaves. The next day, the duck comes in once again and yet again demands, “I want to buy some peanuts!” The outraged bartender yells back, “I told you, I don’t sell peanuts! If you ask one more time, I’ll nail you to the wall!” The duck leaves. A guy goes onto a rooftop bar and is sitting next to a guy who says he’s drinking a magical drink. He asks “What’s so magical about it?” the guy drives a car and flies it around the rooftop. the other tries, but falls of and dies. The bartender shakes his head and says. “Y’know, you’re a real jerk when you’re drunk, Superman. The lab owner strolls in with her dog and orders a beer. The bartender tells her, “Sorry, you can’t bring your dog in here.” “He’s my seeing eye dog,” the woman replies feigning offense. The bartender quickly apologizes and serves her the beer. Q: Why do Norwegian ships have barcodes on them? The guy says, “75 cents,” and runs out the door. 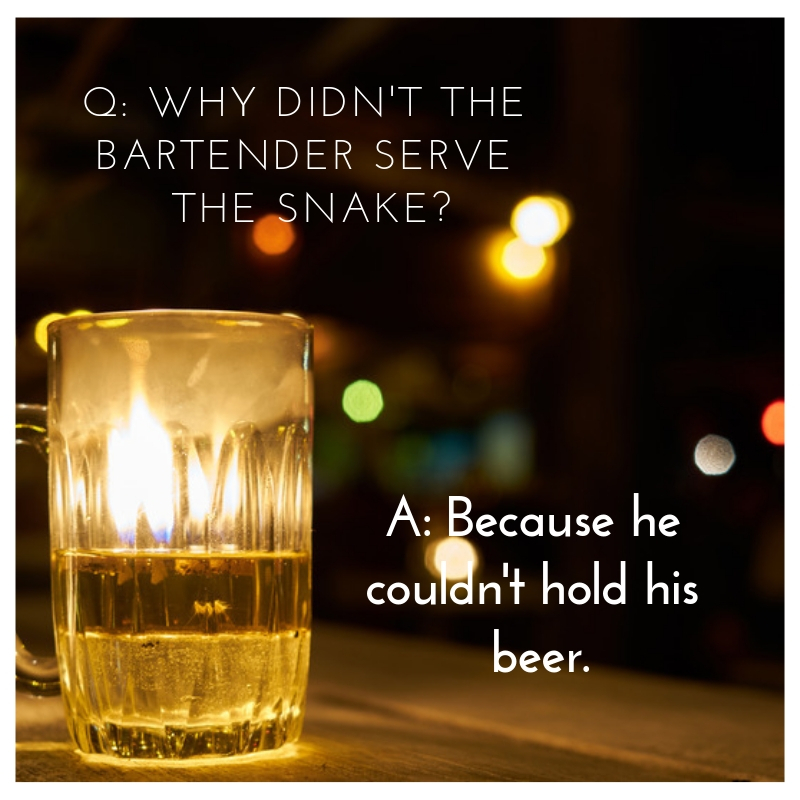 Q: Why didn’t the bartender serve the snake? A: Because he couldn’t hold his beer. A guy walks into a bar and asks for 10 shots of the establishment’s finest single malt scotch. The bartender sets him up, and the guy takes the first shot in the row and pours it on the floor. He then takes the last shot in the row and does the same. Q: What do you call a basement full of women? The friend pulls out an old lamp and tells him the genie inside will grant him one wish. The man rubs the bottle, and to his amazement, a puff of purple smoke spews out and slowly collects in the form of a genie. In a booming voice the genie tells the man he has but one wish. The man thinks and says, “I wish I had a million bucks.” All of a sudden the bar is filled with ducks, bursting from the door and the windows, standing on top of the bar, dunking their heads into people’s drinks. Q: What does a termite say when he walks into a bar? A: Is the bar tender here? A gorilla walks into a bar and says, “A scotch on the rocks, please.” The gorilla hands the bartender a $10 bill. The bartender thinks to himself, “This gorilla doesn’t know the prices of drinks,” and gives him 15 cents change. 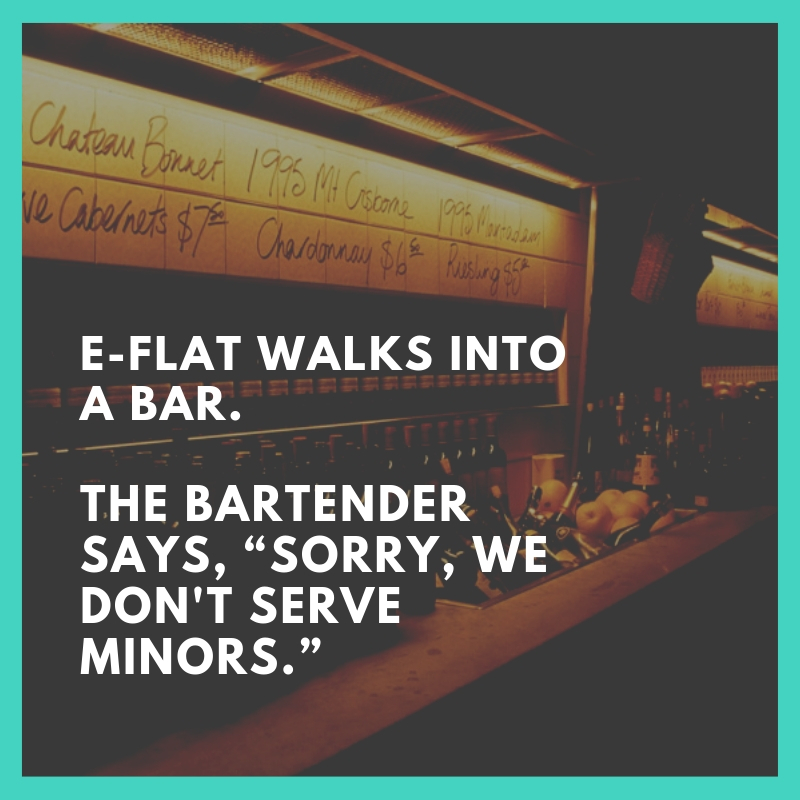 Do you like bar jokes? Then we have the best ones for you! 21 bar jokes will definitely your friends clutch their sides from laughing very hard. You don’t need to worry about your reputation as the funny one in your group because we’ve got you covered.